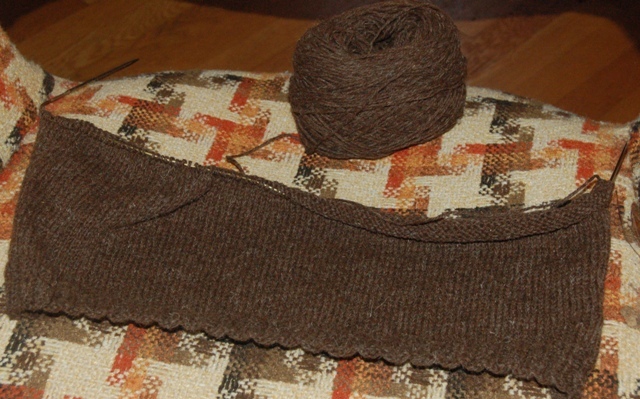 Right now I have two new large projects on the needles. The first is the bamboo ballerina tank from SWTC. This is a sample for the store so I will never actually wear it, but I still have to make it fit the little fake plastic girl who hangs on the wall. I am making the smallest size so it should go pretty fast. The second project is a sweater for me. It is a very simple stockinette stitch sweater that I am designing to fit me perfectly. I did all of the swatches and calculations last week so I am now about 10" into the front side. I started doing the front and the back at the same time so they match up perfectly, but the two balls of yarn were driving me crazy so I switched to the old way of doing one side at a time. I have 5 balls of this yarn and I am really hoping it's enough, my estimations make it really close, but I don't think that I can get any more so if it doesn't make it I will either have to add another color or make 3/4 sleeves. Here's my progress so far.